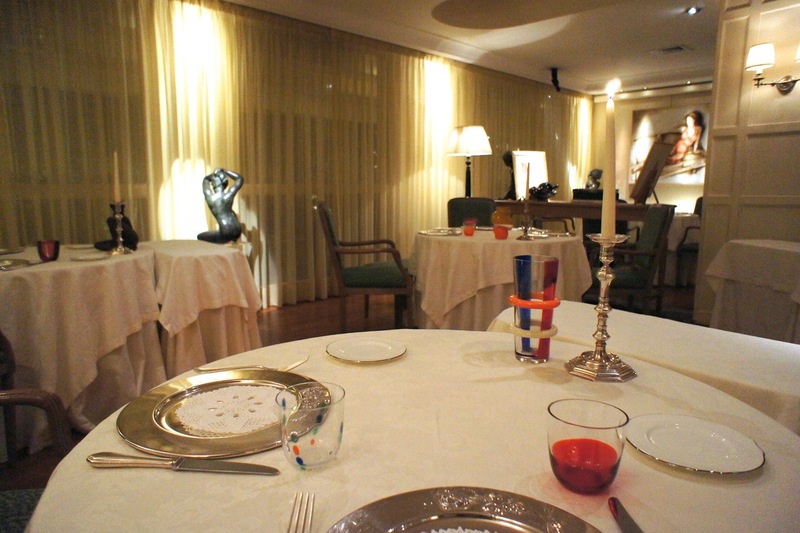 Update: La Tenda Rossa lost its Michelin star in 2016. 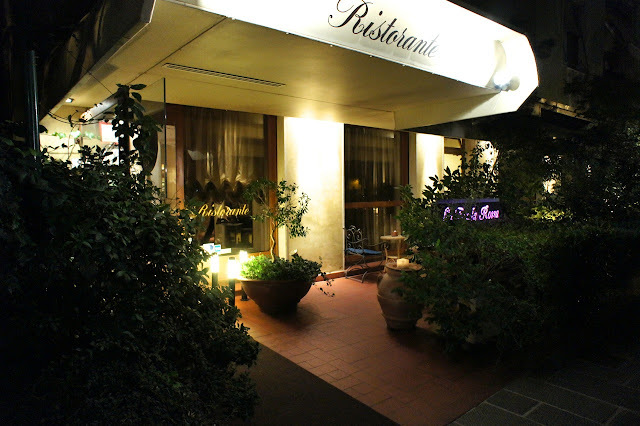 La Tenda Rossa is a 1 Michelin star Italian restaurant in a small town just outside Florence city (about 20-30min drive). The town appears to be very residential and not very picturesque, unlike many other older towns and villages in Tuscany. The restaurant itself is located just at the main junction just upon entering the city and parking is available on a back street leading to it (on which a prominent youth and sports centre was located). It was a Tuesday night and the restaurant was very quiet, as we were the only other couple dining there that night. A family-run restaurant (like many of the restaurants in the countryside in Italy), we received a warm reception and were seated with a complimentary glass of local Rose wine. 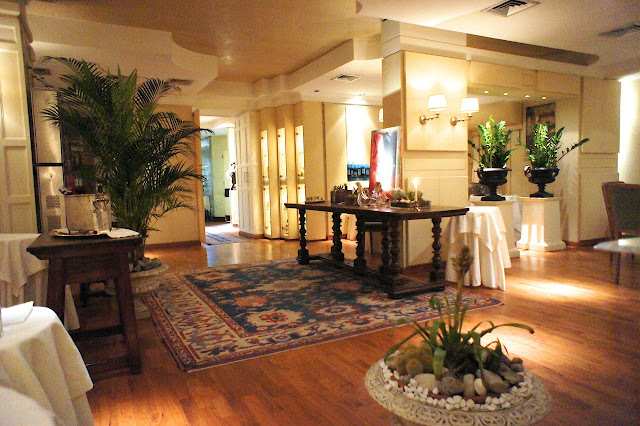 The interior was quite tastefully decorated, and the dining room was very large with relatively few tables, ensuring that the guests at each table had adequate amount of privacy. In some ways, the interior of the restaurant reminded us of Dal Pescatore (see earlier review: Dal Pescatore) with its contemporary country feel. 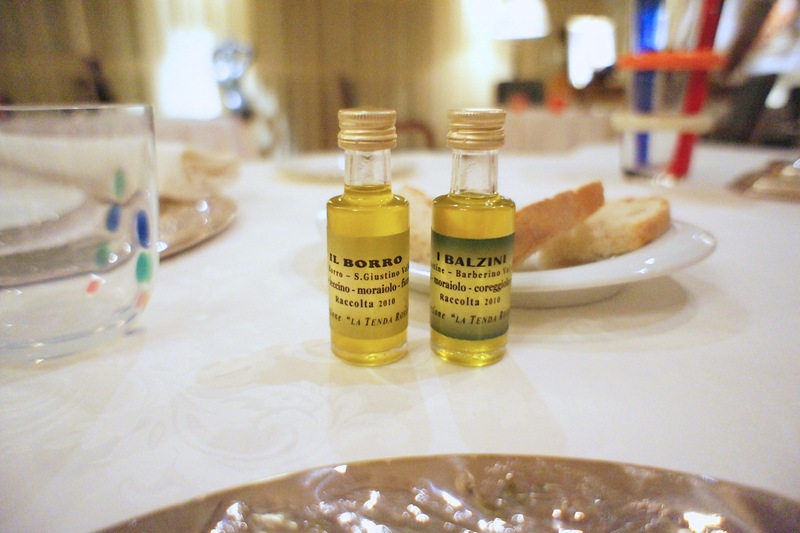 We were served some bread (cold bread, in true Italian fashion) and 2 different types of extra virgin olive oil. However, they failed to help us open or pour the olive oil, and we ended up getting our hands greasy from trying to open the bottles (we expected a bit more from a Michelin star restaurant). This was the start of several incidents which crystallized in our mind a less than complimentary impression of this restaurant. 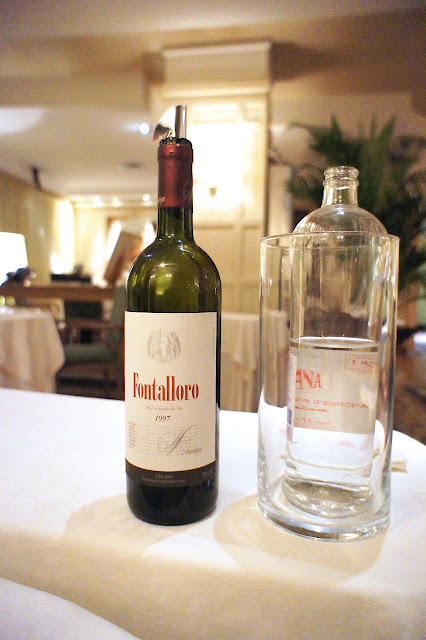 The wine list was quite decent and I picked out the 1997 Fontalloro at a song (the Fontalloro, as I realised later, was probably one of Tuscany's cheapest and most easily available Supertuscans, even more so than the Tignanello). It was a great year for the Supertuscans generally and this bottle was no different. 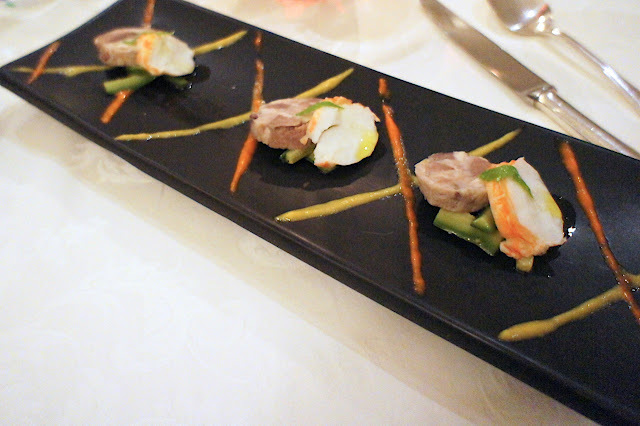 We ordered the degustation menu which actually started very well. 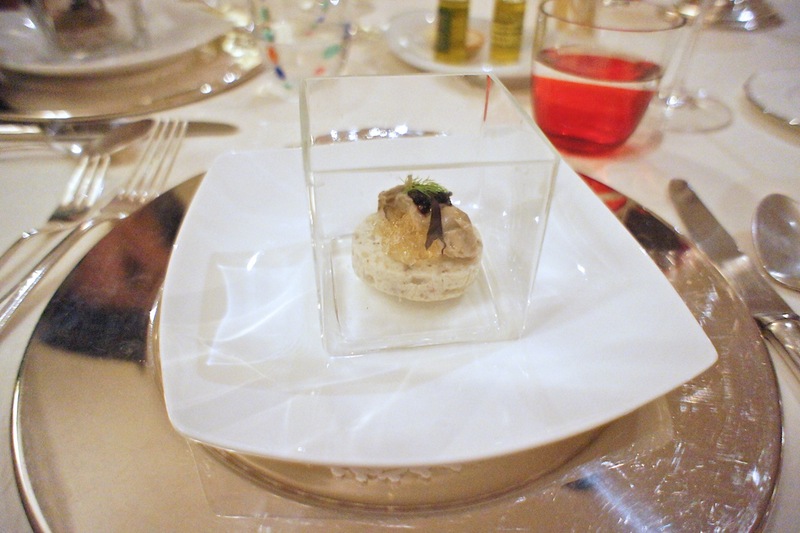 The oyster on foam was freshly shucked and was both juicy and succulent. Next was the lobster and rabbit which was rather puzzling. There were three servings on one plate, and each of them was exactly identical. We'd thought that they try to be different with each one instead of simple multiplying each serving by three. This was the same with the seared salmon dish. 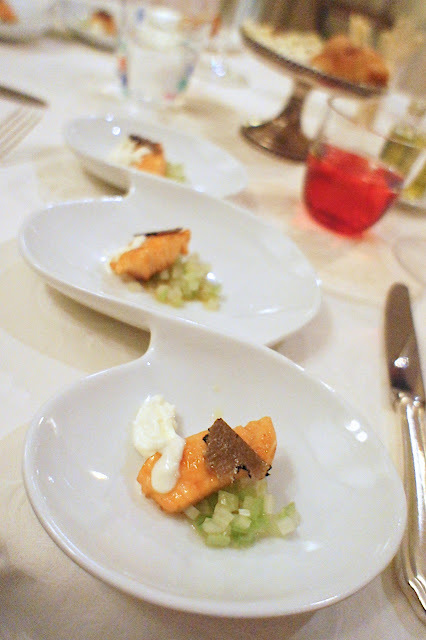 Three identical servings of seared salmon with chopped celery, sour cream and a piece each of black truffle (which wasn't fresh but I think was out of a can). I felt that the salmon was too salty. In all, three times of the same serving was too filling and totally unnecessary. We don't even remember what the next dish was. 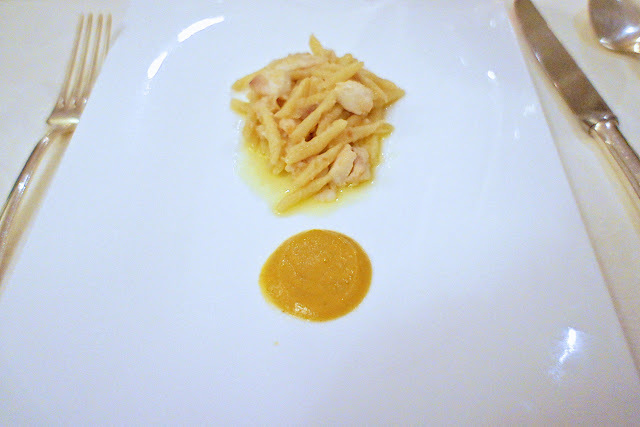 A strange insipid pasta with some pieces of fish and a fish-based sauce (the menu was in Italian and the waiter translated it for us but somehow it was very forgettable). The tortellini stuffed with ragu with pine nuts was significantly better. The pasta was nicely cooked and the sauce worked in this instance. 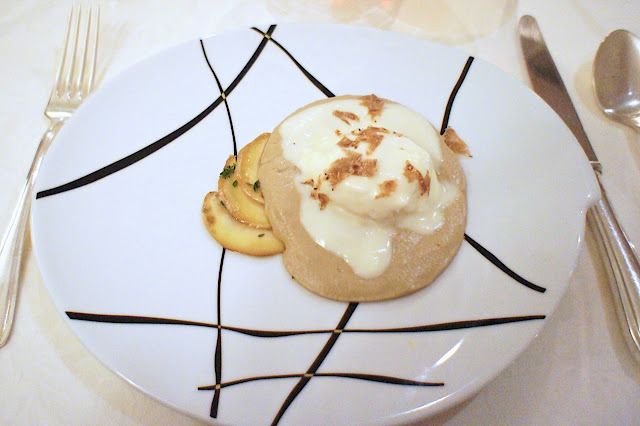 This dish of mushroom puree and fried egg with white truffles and slices of apple was one of the highlights of this meal. 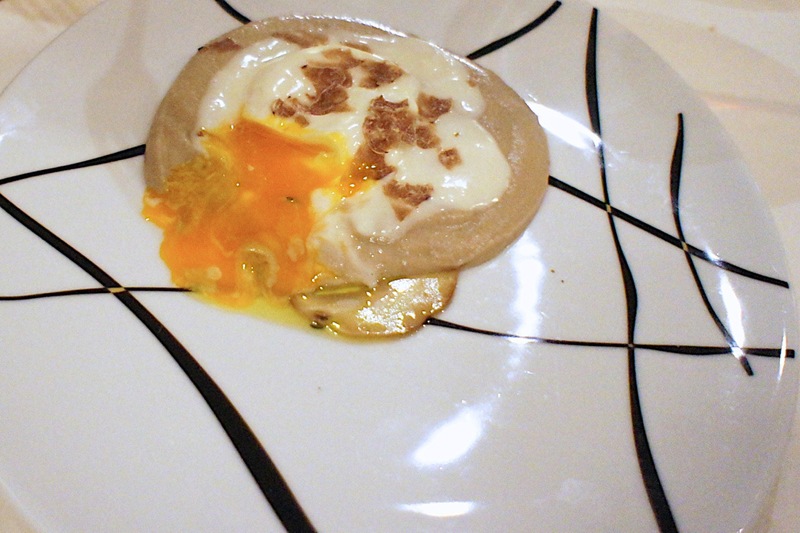 It was a perfect balance between the mushroom and the truffles and the egg yolk which oozed out enticingly when broken. This was one of the simple Italian dishes which we can not get sick of. The final main course was a rather disappointing seared beef steak accompanied by steak tartare and mushrooms. 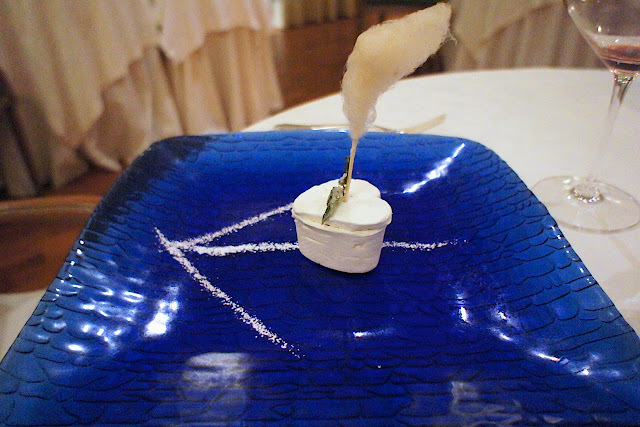 This was another example of the restaurant trying something fancy yet not really getting there. The quality of the beef was not the best and it was cooked with a rather watery and tasteless sauce. Worse still, I am certain that the few pieces of black truffle on the beef weren't fresh but were preserved ones from a can. 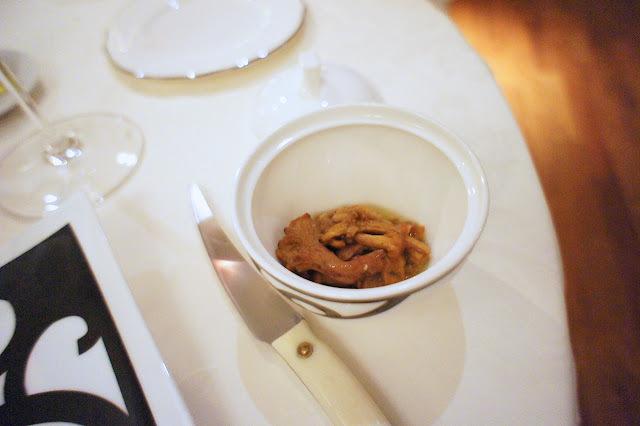 The tartare and mushrooms were nice but the dish was spoilt by the sloppy preparation of the steak. 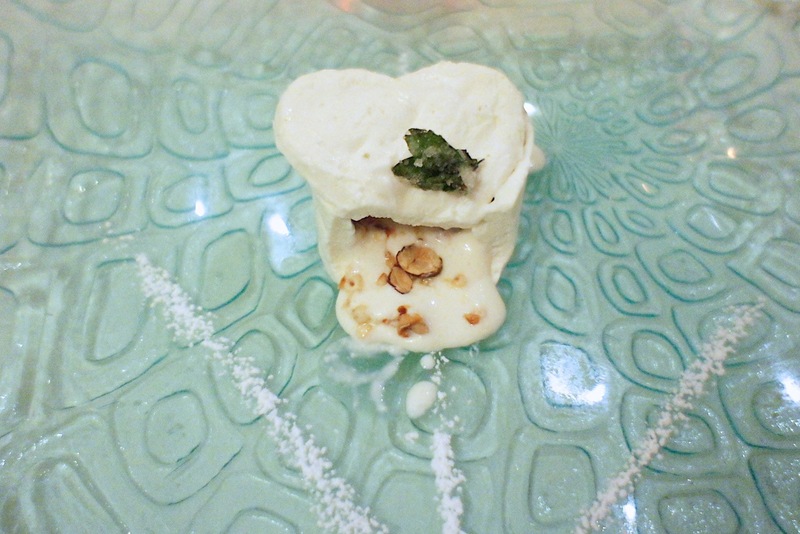 Some hope was salvaged with the dessert, which was a vanilla cream cake with a liquid centre of yoghurt and almonds and a stick of cotton candy on the top. I'm not sure what the icing sugar making the sign of the arrow is supposed to mean but it was only one of the strange things about this meal. The cake was very good though. 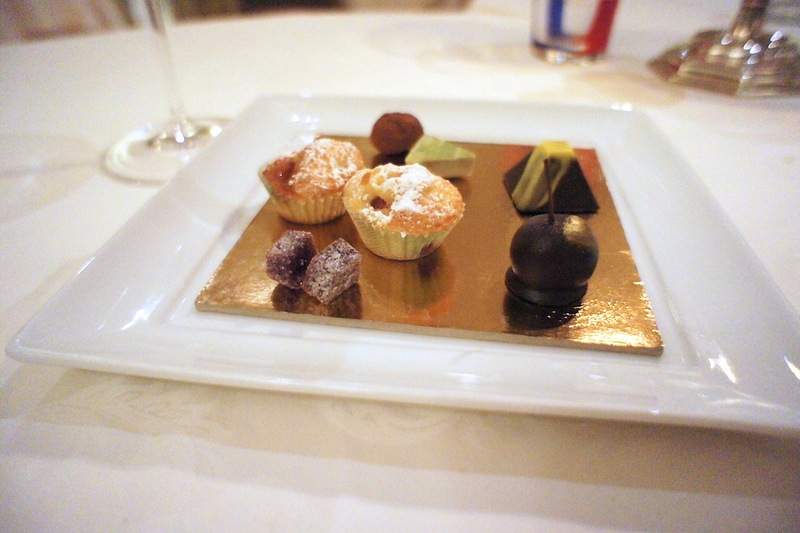 We didn't even managed to touch the petit four, full as we were after a rather unbalanced meal. A few courses that night were good but the dinner was spoilt by what we felt was poor menu planning and execution. 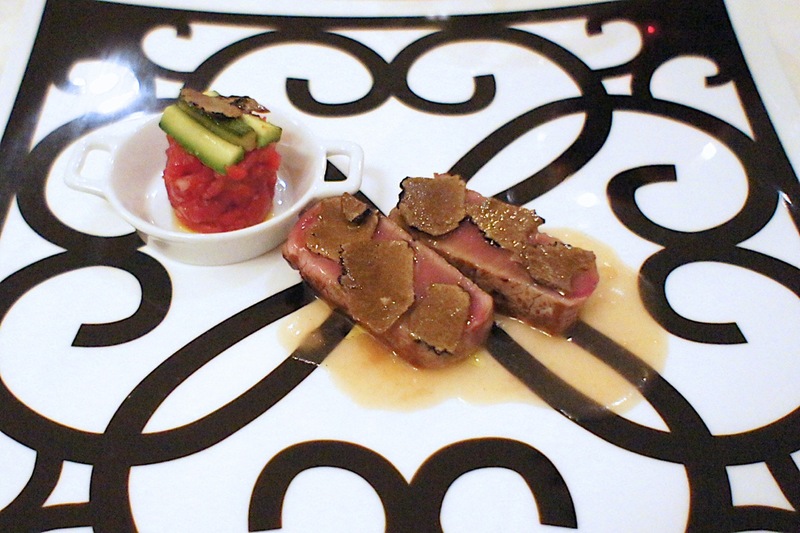 We also felt shortchanged that they didn't serve fresh truffles but soggy ones with no taste which we suspect were out of a can, which was shocking for any restaurant in Italy, much less one with 1 Michelin star. The meal turned out to cost about the same as our meal at Arnolfo (see earlier review: Arnolfo), which was almost a travesty as Arnolfo was so much better. 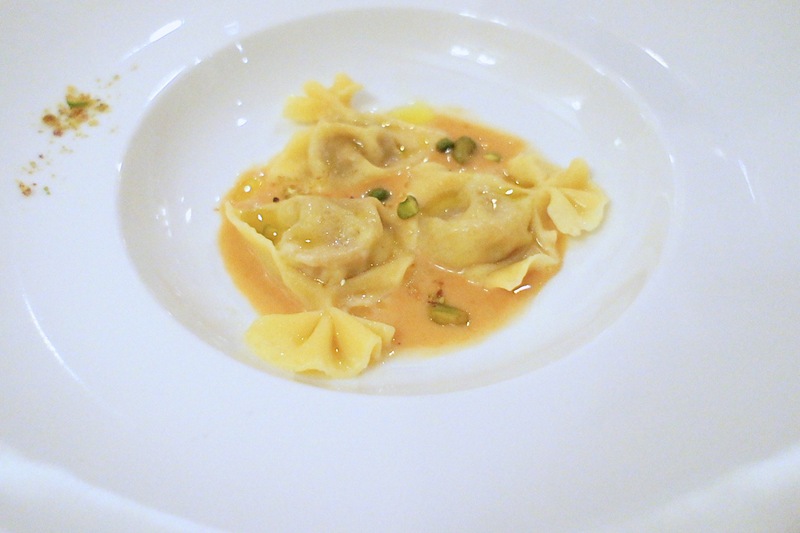 Even the 1 Michelin star Piedmontese restaurants would cost half to two-thirds as much as the one we had here. We can only conclude that the pricing is due to the restaurant's proximity to Florence. Final Thoughts: This restaurant could have stuck to its roots and served up traditional Tuscan/Italian fare (an example where they got it right was the egg dish) instead of trying to serve food in a fancy matter and not getting it right. The cooking was generally fine but what irked us was their insistence of trying to be like a modern 2 or 3 Michelin star restaurant and not having the execution ability to pull it off. Service was also the case of trying too hard to be like a French restaurant yet not getting the nuances of top French waitering (the waiter and waitress who I think were siblings (this is a family-owned restaurant) were standing too close to us throughout).